Miami Heat’s second NBA Championship in 2012 and first for LeBron James and Chris Bosh. It was a combination of a smaller, more athletic lineup, stars living up to the hype and most importantly, the intensity of the team defense. Although Miami is 14-5 to lead the Eastern Conference, their defense has been disappointing thus far, and is a far cry from the lockdown rotating defense of last year. In their five losses, Miami has given up an average of 106.4 points and is 22nd overall allowing 99.6 points per game. Specifically, their lack of perimeter defense and unwillingness to lock down shooters from beyond the arc have plagued the Heat. 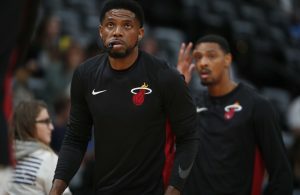 In those five losses, the Heat’s faulty defense has allowed the opposition to shoot 42.4 percent from three point range. It is a concern that could prove costly in a playoff series and something that needs to be addressed prior. Miami has rebounded from their loss to the Washington Wizards on Tuesday December 4, and the 112-92 blowout loss to the New York Knicks on Thursday December, 6, wining back-to-back games against the New Orleans Hornets or Pelicans if it is preferred, and the Atlanta Hawks. “Losing those two games we understood what we needed to do and we needed to get on it right now,” LeBron James said. Seeing a more consistent role off of the bench, Joel Anthony added two steals as well as two blocks in 18 minutes of play against the Hawks and against the Hornets, he had three blocks in 14 minutes. Anthony’s contributions will not fill a stat sheet the way James or Wade can, but his presence on the defensive end has been a large contribution to the overall success over the past two games. In both matchups, the Heat held their opponent below 92 points and scored over 101 points, a sign that the tides are turning. Along with the resurrection of Anthony’s presence around the rim, Shane Battier’s return from a sprained knee has also bolstered the Heat’s team defense. Battier, known for his shooting ability and intangibles as a vocal leader in the locker room, is also regarded as one of the best one-on-one defenders in the entire league. It could simply just be the fact that it is early in the season, and as an elite team, Miami simply puts forth the effort on defense when necessary. 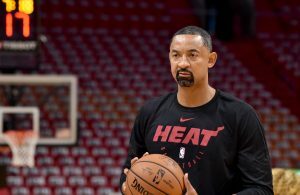 But if they want home court advantage throughout the playoffs, the Heat will have to keep the switch turned “on” to combat their opponent’s high octane offense. Looking forward, Miami has five of their next six games at home, the lone road game against the Dallas Mavericks, who are still without all-star forward Dirk Nowitzki on Thursday, December 20. Miami’s recent success will be tested with a matchup against the surging Golden State Warriors (14-7) on Wednesday in South Beach. Expect a fast-paced transition game with a plethora of shots being thrown up. “We continue to go in the right direction, it’s not perfect now, and there is a lot of room for improvement,” James said.